Because of some patients's medical condition, you may be asked to wear an isolation gown, not to be confused with a hospital gown, as well as medical gloves when you partake in their care. 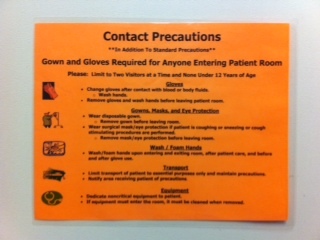 The reasons why are too many to list here, but if any patient is on any kind of isolation precautions, you should definitely wear one. Sometimes I'll even wear one when I'm giving a patient a bed bath or changing their adult diaper if I think my arms will come in contact with them. It can be nice just to have that extra protection in some situations. They are made of nonwoven fabric which makes them durable enough to provide protection against infection, but disposable at the same time. An isolation gown is disposable because when a patient is on isolation, you are supposed to get a new one every time you go into the room. If you reuse the same one, you risk getting what previously got on it onto you which would defeat the purpose of wearing one. Treat them like you would a pair of medical gloves. You only wear them once because trying to put them back on again would be too much of an infection risk. Use them one time and one time only. Most isolation gowns are worn almost like a hospital gown. It may seem odd at first, but you put them on like a jacket or button-up shirt, only backwards so the strands to tie it are behind you. There should be two places to tie it, one at the neck and one at the waist. I usually tie the neck together in front of me where I can see what I'm doing and then I flip it around my head. Tie it however you like, just make sure it's not going to untie itself with a little movement. My wrists used to always get exposed after wearing gloves and moving around in the gown. The sleeves would just slide right up my arm. To solve this problem, I now poke holes at the end of the sleeves and place my thumbs in them. It sounds silly but hey, it works. To take the gown off, you can just untie it and slip out of it. Just make sure you don't touch your skin or clothes with contaminated gloves in the process. This is why I believe the way I take it off is easier. I grab it at the neck and just rip it apart. That way I can slip it over my head and slide the sleeves off of my arms without my skin touching the outside of the gown. They are pretty long, so it's really easy to have part of them hanging over the standard waste bin. Do not let this happen. Be sure to get all of it inside the bin. If you don't, you could easily get yourself, or somebody else, infected by brushing up against it as you walk by. Wearing an isolation gown may seem like a waste of time, especially if you are just coming into contact with the patient for just a second. Don't think this way because getting infected only takes a fraction of a second. There is always a good reason when you are recommended to wear one.